Practical Benefits * How does a Composting Toilet Work? · Clean, simple, hygienic and practical solution. A biological composting toilet providing sound techno/ecological balance — a perfect solution for our human peace of mind. The main job of a composting toilet is to contain human waste and create conditions for rapid decomposition – including any pathogenic organisms – into humus; a safe stable soil-like substance. This humus product is then an essential fertiliser or organic nutrient suitable for plant and tree growth. It can be composted and dug into the earth to enrich the soil for nature’s benefit. You may find the compost tray is emptied just once a year. Rapid decomposition requires adequate oxygenation to remove any excess liquid. The air flow that enters the composting toilet ensures this process whilst also eliminating any odour via the unit’s vent pipe. Under typical conditions the process is complete in 60 days but disposal is normally required less frequently usually just once a year. Our own experience is that a natural and healthy diet produces a stable organic waste that is in fact almost entirely free of odour. A composting toilet is easy, hygenic and safe to use with long term economic and environmental benefits. What is more it includes us in nature’s most natural recycling process! A Historical View - rich resource or flush it ?! Everything you need to install the composting toilet unit is supplied in the box, including an easy to follow manual. If you need a longer length of standard 6” plastic pipe it is readily obtained from most hardware stores. You can be confident that basic DIY skills are all that you require. IF YOU NEED OUR ENGINEER TO INSTALL for you - please enquire for a quotation. 2. (NE Only) THE DRAIN PIPE CONNECTS to the back of the unit, and must then exit to an external drain or soak away – either under the floor or simply through an exterior wall. 3. THE FLEXIBLE AIR VENT PIPE must pass through the ceiling, or though an exterior wall. Roof–flashing is supplied. The ceiling is securely sealed with silicon and a rain/insect cap is fitted. 4. FOR ELECTRIC VENTILATION a DC (Solar) or AC (mains) connection is required. The Solar powered models are supplied with a small solar panel which is easily mounted on a south facing elevation –the thin power cable can pass through the roof via the vent pipe. 5. 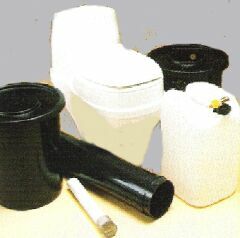 A COMPOST STARTER BAG can be supplied, and you place this in the Toilet unit the first time before use. It is a curious fact that our western society begun with a very different view from our Eastern neighbours. We in the West saw our human waste as something to be rid off quickly and out of sight. In the East it was considered a rich resource. Perhaps in the West the people simply followed the example of our “landed gentry”, the wealthy ruling class, who upon building their castles, would excrete their business directly into the mote – the water surrounding their castle. By example then, except for the peasant people, the city population disposed of their own directly into the street to be flushed away or not by the rain; "Duarde Chuva!". But in the East, in particular in China and Japan traveling people were often enticed by farmers to use their way-side privy, and in cities human waste was collected and transported out into the neighbouring farm land. It was such that several visitors staying in an Inn would receive a discount in payment simply by exchange for their collective deposit of humanure! Neither example was without some serious drawbacks and health risks, which history relates. Today we benefit from technology and knowledge – we understand how to work with nature. A biological composting toilet provides ecological balance - a perfect solution for our human peace of mind. · SAFE UNIT CAPACITY – how many people for occasional or continuous use? · VENTILATION – do you need a DC or AC power source for extra ventilation? · TEMPERATURE – In cold locations you may need additional automatic heating. 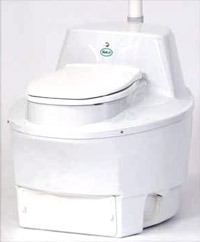 BioLet Komfort XL (55 and 65 NEW 2011) is a fully-automatic unit with extra capacity. For larger families or residents, the BioLet Komfort and Komfort XL is the right choice. These units are fully automatic, the XL has a 40% larger composting chamber, two heating elements, ventilation fan, advanced mixing mechanism, and excess liquid sensor. 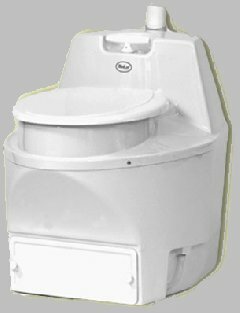 Previously tested and approved by various national sanitation departments worldwide, the BioLet XL has exceeded all testing requirements by a wide margin and was proven to be the safest composting toilet available. A 225 Watt heating element heats the air that is circulated through the composting chamber. The temperature is thermostatically controlled to 18 degrees C. Air is automatically vented by a 25 Watt motorised fan located in the unit’s vent pipe exit. Typical daily power demand is approx. 55 Watts. Capacity: 4 people continuous use to 6 people part-time use. BioLet Standard is a semi-automatic unit with Electric AC fan assisted ventilation and heat element. The standard model is easy to use and ensures optimum aeration with automatic ventilation. To provide a simple means of rapid organic breakdown of compost the unit is fitted with a manual mixing rod which can be turned after use. Capacity: 3 people continuous use to 4 people part-time use. BioLet Deluxe is a fully automatic mixing, heating element with AC Electric fan assisted ventilation. A practical and superior choice where convenience and reliable composting is essential in cold locations and climates. Automatic mixing occurs after each use by means of a twin-blade electric mixer. Automatic heating and venting is the same as the Standard unit. Peak power rating is just 290 Watts. Typical daily power demand is approx. 110 Watts. Fluid indicators are fitted standard. BioLet Separera - Where humidity is a concern the Separera offers a solution. This unit is supplied with separate containers – one inside the toilet for solids and paper and one outside the house, or under the floor, for liquid. When you use a Separera the liquid and the solid are separated while it is being used. The chambers are designed for ease of use. The urine may be mixed 8:1 with water for ideal use as a fertiliser. Separera 40 – Basement installation of container below bathroom. The Separera 40 unit is fan-assisted to ensure optimum aeration of the solid waste and to vent out any odours. These models require an 18 Watts AC mains supply. Capacity: 4 People continuous use. VISA/MASTERCARD PayPal also accepted (+4% surcharge) * No PayPal account needed.